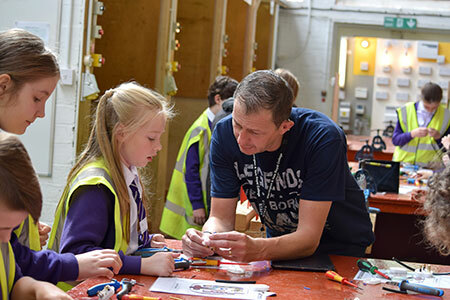 More than 360 primary school children have been given a unique insight into the future with an inspirational day of discovery at Warrington & Vale Royal College. Pupils from 10 Winsford primary schools visited the college’s Hartford campus as part of the event, organised by the Raising Aspirations Project, part of the Winsford Whole Place programme. 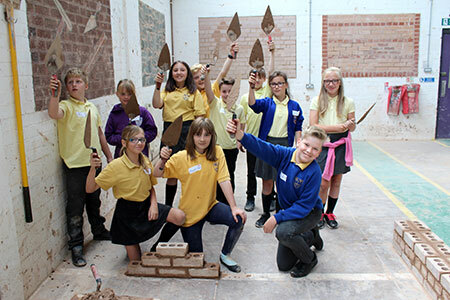 They were shown what it would be like to attend Warrington & Vale Royal College, with fun activities including mini gateaux making, car maintenance, hair ups, bricklaying, carpentry, electrical engineering and graphic design. The exciting event offered pupils career ambitions and portrayed a future within post 16 education to which they can strive. Stephanie Hutchinson, school engagement manager at Warrington & Vale Royal College, was instrumental in the event’s success, ensuring pupils had a great time from the moment they stopped off their coaches until the moment they went home at the end of the day. She said: “As a college, we really enjoyed being a part of this important initiative. We have had some really positive feedback from both the children and teachers involved. Our curriculum staff also had a great time – the pupils were really enthusiastic and took everything on board. They behaved fantastically and were a credit to their schools. Other sessions on the day included electrical installation, business and travel, media, art and design, drama and dance, ICT, applied science, health and social care, sport and team building workshops. Cllr Nicole Meardon, Cabinet Member for Children and Young People, said: “The Raising Aspirations Project is all about introducing Winsford’s youngsters to the real world of work and helping them realise that they can pursue whichever career they wish. If other industries or colleges are willing to support the project by introducing Winsford’s children to the world of further education and employment, contact Janet Kolita on janet.kolita@cheshirewestandchester.gov.uk.